Advertisement for O’Connell’s Ale (1930s) | Come Here To Me! « Some foreign media coverage of key Civil War events. I had to laugh seeing this advertisement for O’Connell’s Ale popping up frequently in An Phoblacht in the early 1930s. Daniel O’Connell of course was far from a militant republican, and one wonders how he’d feel on the pages of that organ! 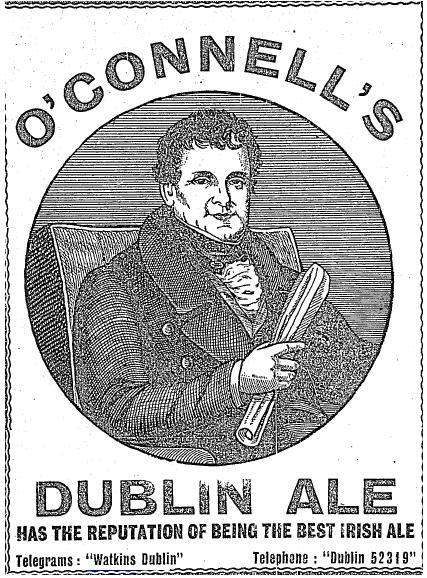 Daniel O’Connnell Jr. had famously acquired the Phoenix Brewery in James’s street in 1831, which produced O’Connell’s Ale. It should be noted that O’Connell and the Guinness family were at times political rivals, something best captured by the 1841 ‘Repeal Election’, where O’Connell had stood against and defeated Arthur Guinness Jr. This period would see a sizeable boycott of Guinness, dubbed “Protestant Porter” by sections of the populace, though this was against the wishes of O’Connell himself. John D’Arcy continued to brew O’Connell Ale after the family had ceased their role in brewing, and in time production moved to the Anchor Brewery in Usher Street. Watkins eventually took up the brewing of O’Connell Ale, and this advertisement was placed by them in the pages of leading newspapers in the 1930s. While Arthur had failed to defeat O’Connell at the Ballot Box, I always wonder what O’Connell would think of the Guinness Empire today every time I see a Diaego truck pass his statue.